THE KANSAS CITY CHIEFS’ STELLAR SEASON IS OVER, BUT THE NATIONAL EXPOSURE THEY HAVE GENERATED HEADING INTO THIS FALL PRESENTS A RARE OPPORTUNITY TO MARKET THIS REGION IN BROADER BUSINESS TERMS. Perhaps this is no big thing if you live in New England, where fans of the local professional football team will relish a third straight appearance in the Super Bowl next month, and ninth NFL title game in the storied career of Patriots quarterback Tom Brady. But even though the Pats blew town with a measure of our pride following the AFC championship overtime victory at Arrowhead Stadium, they left us with something that this region can build on: A higher national profile among NFL fans. And a great many of those fans are in business, or are running companies. This year’s on-field success means that the broader region will be in a unique position next fall to command sweet telecast slots. And those will create opportunities for civic organizations to leverage that awareness and sell the city’s brand, in ways we’ve not experienced … ever. Selling Kansas City wasn’t exactly a major civic initiative the last time the Chiefs made it to the Super Bowl. A lot has changed in regional marketing since then. The timing couldn’t be better. Just this month, participants at Ingram’s 45th Anniversary General Assembly discussed the crying need for this region to better tell its story to expansion-oriented businesses, executives from companies seeking to relocate, and talented college graduates looking for places to call home. In that sense, what we saw in the Jan. 20 setback on the field is, as quarterback Patrick Mahomes intimated, a stepping stone, and not just for the team. read: entertaining—with a full season under the quarterback’s belt. In addition to their traditional AFC West home-and-away series with Denver, the Los Angeles Chargers and—it will take some getting used to saying this—the Las Vegas Raiders, the division teams will square off against AFC South and NFC Central opponents. Seasoned fans will recognize the significance of the latter, with home games at Arrowhead against the Green Bay Packers and the Minnesota Vikings, Kansas City’s opponents in its only two Super Bowl appearances. Also coming to Arrowhead will be the Indianapolis Colts, who will be looking for some payback after losing the AFC semifinal game to the Chiefs earlier this month, 31-13, the Baltimore Ravens and the Houston Texans, which both made this year’s playoffs. Kansas City will travel to Tennessee, Jacksonville, Chicago and Detroit. That leaves one other away game, at a date yet to be determined. And whaddaya know? It will be against none other than Mr. Brady and his Patriot posse. That is if he doesn’t retire after the 2018-19 season. 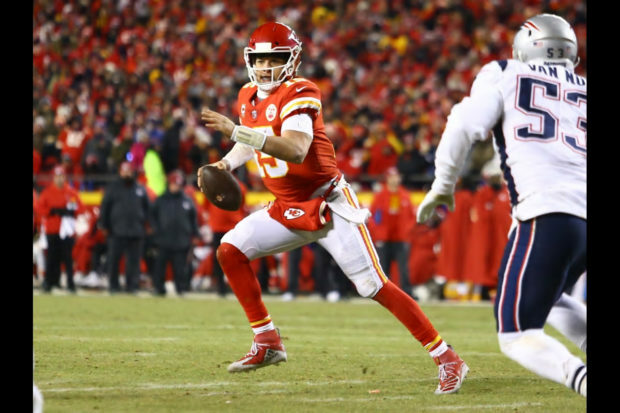 Why Kansas City is being tasked with games in Foxboro, Mass., in back-to-back years, rather than getting a home game out of that matchup, is known but to the scheduling czars of the NFL. But it ought to be a good one. And it will draw a lot of eyeballs to TV screens nationwide. Opportunity is knocking . .